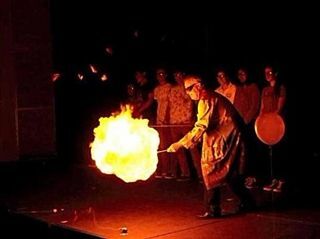 Audiences of the Science Extravaganza were treated to a variety of narrated science demonstrations that made them think, laugh, gasp, and clap along to the musical soundtrack. Beethoven's 5th Symphony seemed to cause solutions to change color, as if by magic. David Bowie's hit song "Changes" served as a fitting score to a mesmerizing and colorful display of acid and base reactions. And for the finale, John Philip Sousa's "Stars and Stripes Forever" serenaded balloon-popping fireballs. The critics' review? Science is awesome!